Premium Scuba Dive Shop in Manchester. Top Brand Equipment at Best Price in the country. 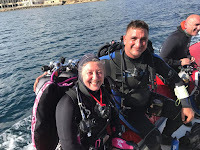 All Courses Available from beginners to pro levels; Recreational diving to Technical Diving. Over 1400 Students all over the world. Feel Free to pop into the shop! DM Club Xmas Bingo Party 2018! Christmas Season has come!! DM Club Annual Xmas Bingo Party was on! We were back to Friendship Inn in Prestwich this year again. It was soooo good last year, so we had to come back for this year. Christmas is the Season of Joy. Having a Club Dinner is a brilliant opportunity to share this happy feeling. We had 39 people joining to this Dinner Party. We started with pre-meal drinks & chat. Socialising with other divers is always nice. Your next diving gets even more FUN. For the seating, we shuffled everyone. So, you were not to sit with people who you normally sit together. 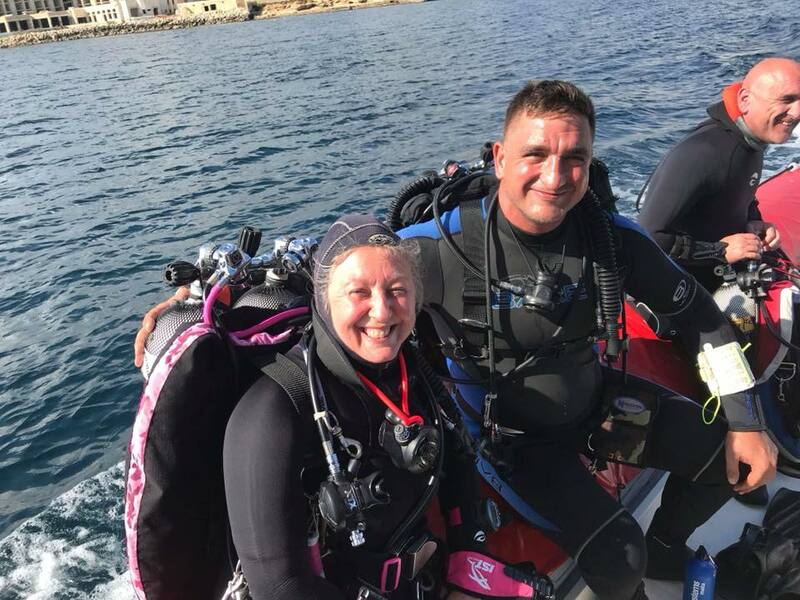 You get the chance to sit with other divers and make new friends. After all, we all were divers. We have one thing in common; Scuba Diving! And we all love it! Dinner was wonderful. So good! It was 3 meal course. We even had Vegan menu for our Vegan members. And it was very tasty. That is why we have our event there. When we were about to finish the dessert, it was finally the time for Xmas BINGO!! Our Xmas dinner must have BINGO. It is Christmas dinner. Getting a gift is mandatory. 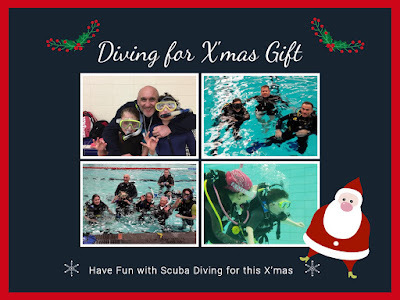 The top gift for this year was Aqualung i200 Dive Computer, followed by all sort of goodies. Always fun to have games with prizes. We love having gifts, don't we? Year 2018 has been challenging yet very successful and grateful. It is all because of the great support from DM Club Members and Friends. Thank you all for great support. Dive Manchester is one lucky shop with great supporters. Have a lovely Holiday Season, everyone!! DM Club Trip, Red Sea 2018 part II - "Simply the Best" has been really the BEST! February Red Sea Trip is our annual DM Club Trip as some of you may already know. Since our last February trip was very successful (in other words, it was great FUN!! ), we had more request for Red Sea Trip. Here it goes! We organised another one this year!! This time, itinerary was "Simply the Best", starting at Brothers Island and moving onto the south...and it was the original plan. In the previous week of our trip, there were 2 Shark attack incidents in Brothers Island unfortunately...so our itinerary was quickly changed. Well, after all, safety comes first. Weather was brilliant for whole week. Water temperature was 26C degree. Yes!! Great!! We were a little anxious about the water temperature, but it was much better than we expected. Although this itinerary requires certain level of experience as a diver, it was the very first "Liveaboard" for some of the members. You know what? They LOVED IT!! Liveaboard = "Eat, Sleep, Dive, & Repeat" Who would complain that?? Marine life was brilliant. Sharks, Dolphins, and all the colourful fish. Some wreck divings as well. Some pictures are up on the Facebook page. Have you not done Liveaboard yet?? Ohhh!! You are missing the great fun!! Our February 2019 trip is already full; however, don't worry. We have another trip already planned!! From 26th of April till 3rd of May 2019, "Northern Wrecks & Reef", the most popular itinerary in the Red Sea. Are you interested? Contact Dive Manchester for more details. Still a few spaces are available. Do you want to have fun with DM Club? What are you waiting for? Give us a call! It's gonna be FUN!! Scuba Diving for Christmas Gift! Great Winter Activities!! Bonfire Night is over. It is now time to start thinking about Christmas! Too early you say? Nahhhh! It is already November! Time flies from now on! Struggling with Christmas Gift Ideas? How about Scuba Diving? Discover Scuba Diving (Try Dive) can be done in warm heated swimming pool, you see. It may be a good activity during the winter. Also Skill Development & Knowledge Development can be done in warm condition even in UK. Great activity idea for winter season when outside is not so pleasant for outdoor activities. If you have questions, please do not hesitate to give us a call. We can tell you all about Scuba Diving! Diving is FUN!!! Some people say "UK diving is not as good as oversea diving". Well, yes, there are beautiful coral reef divings available overseas; however, UK diving can be amazing eye-opening experience. 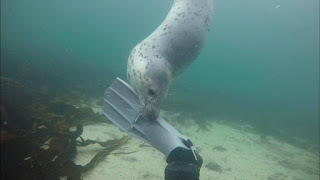 Seal Diving is one of the example. Seals are like puppy dogs. As soon as they find you, they accept you as "play mates" and start playing with you! When you are diving, you are basically "visitors" in the water world. You will enjoy watching and visiting beautiful marine creatures. Some of them may show you their interests in you, but there is hardly any interaction with them. Don't go! Play with me!! When it comes to Seals, they are totally different. 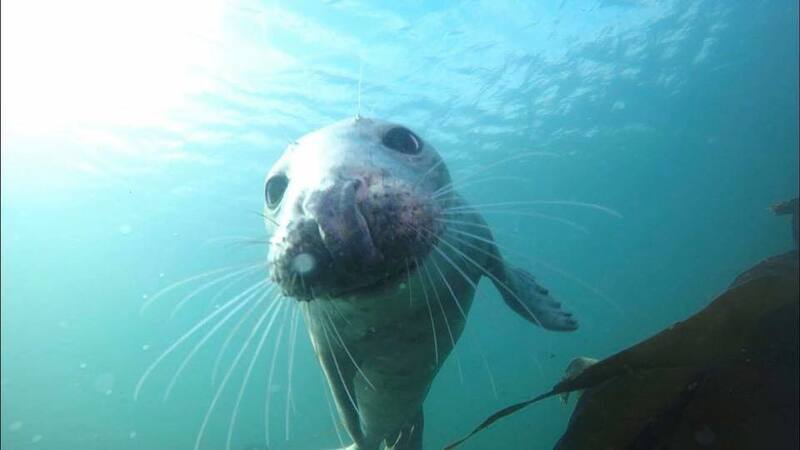 Farnes Island area is well protected area, so they know that the divers won't harm them. They know that we are coming to visit them. They know that we LOVE to PLAY with them. They will come to nibble your fins, ask for belly scratches, give you High Five, etc. My first experience with Seals grabbed my heart. 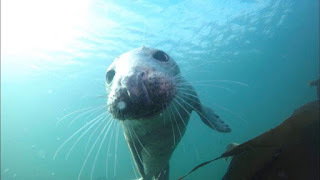 Seal Diving Trip is one of the trips that you MUST try in UK and DM Club organise Farns Island Seal Diving Weekend Trip annually. We all love it! Have you not tried yet? Oh, you must!! I'm sure you will fall in love with them. They know "Diving is FUN!!" 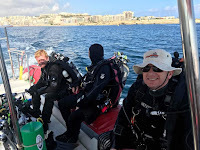 SDI Solo Diver Course - Ready to take full responsibility for own safety? For Scuba Diving, Safety is very important factor. After all, we don't live under water. (I wish I could!!) The more experienced you are, the more we shall be humble about safety check and all. We shall not forget 'Buddy Check' not only for your buddy's safety but also for your own safety. 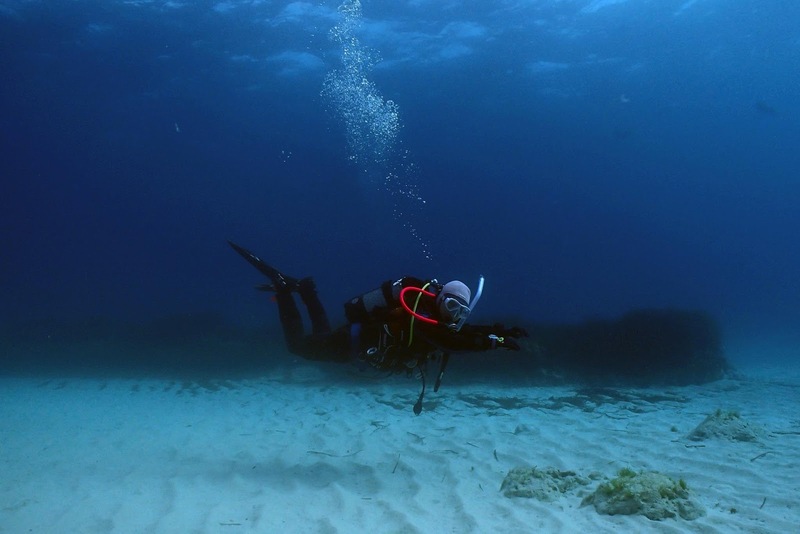 Buddy Check is a common standard for safety in Scuba Diving, Recreational & Technical Diving. We are not supposed to dive ALONE...unless you are trained for it. Yes. There is a specific training course for Solo Diving. 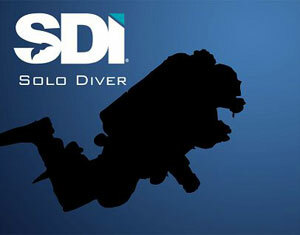 SDI Solo Diver Course is the practice of self reliant scuba diving without 'Dive Buddies.' 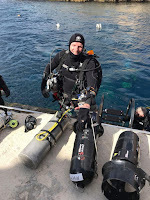 Solo divers should be skilled in self-sufficiency and willing to take responsibility for their own safety while diving. It is not for everyone. The Solo Diver Course stresses proper dive planning, personal limitations, and accident prevention, as well as the benefits, hazards, and proper procedures for diving solo. As you can see, diving with Dive Buddies is less stressful and easier. When you have two or more people to solve one problem by helping each other, of course, that will be easier. For Solo Diver, you have to rely on your own ability and even equipment. You have to be well prepared. 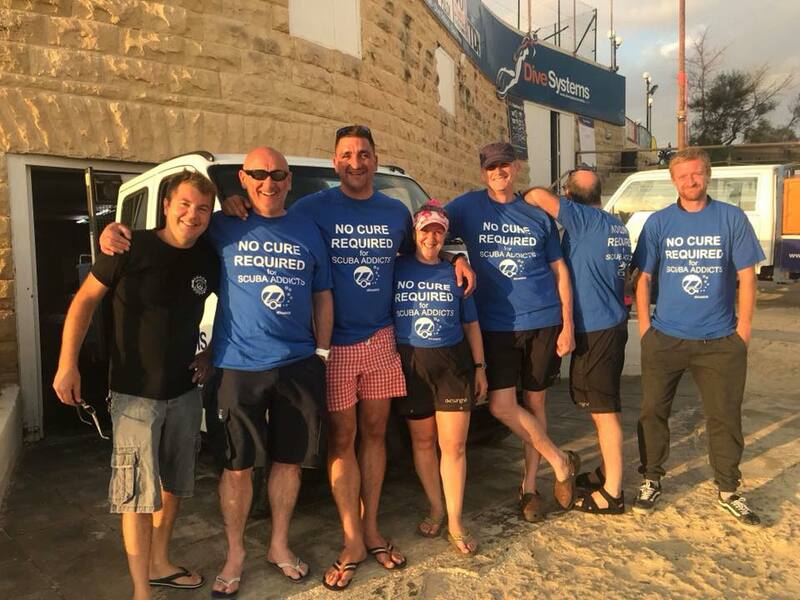 This course is, however, great course for underwater photography and underwater video divers as well as those diving with their buddies who may not be very experienced in scuba diving. Since it is a rather challenging course, course prerequisites is a bit more than other specialty courses. Minimum age 21 year old, certified as SDI Advanced Diver or equivalent (completing 4 Specialty Course, etc. Much higher than PADI AOW Diver), minimum 100 logged dives. You shall have good level of knowledge and skills in order to take this course. It is challenging; however, it will train you very well to be self sufficient and safety aware divers. Are you interested? Are you ready for the challenge? If you say 'Yes', you can always contact Dive Manchester. We are here to give you good challenge and achievement. Let's take the next adventure!! 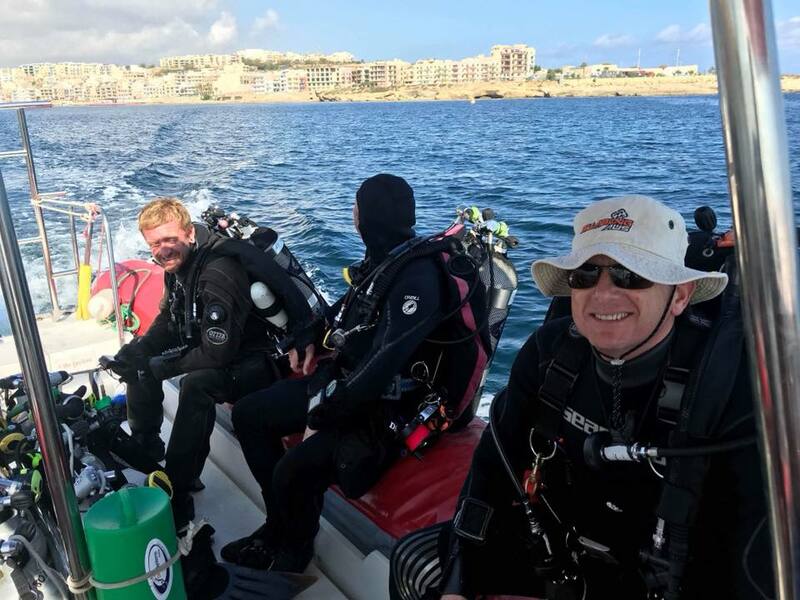 Malta is one of the popular destination for scuba divers, not only Recreational Divers but also Tech Divers. Maybe not so much for Fish Lovers, but cristal clear water and many kinds of wrecks in different depth, that is something other countries cannot offer. DM Club Tech Week in Malta 2018 started on 21st of September. We used the facility and service of DiveSystems Malta. They are one of the best dive centres in the island. 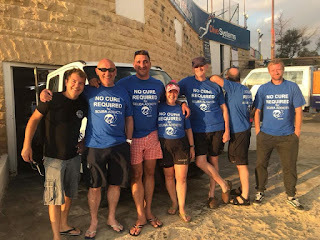 We used to live in Malta, working as Scuba Instructor about 5 years and we know DiveSystems is most capable dive centre there for Recreational and Technical Diving. Our plan was to dive on HMS Stubborn (submarine, about 55m deep), HMS Southwald (ship wreck, about 70m deep), and Le Polynesian (ship wreck, about 60m deep). Unfortunately, half of the plan had to be changed due to the strong wind coming from big storm covering Mediterranean. 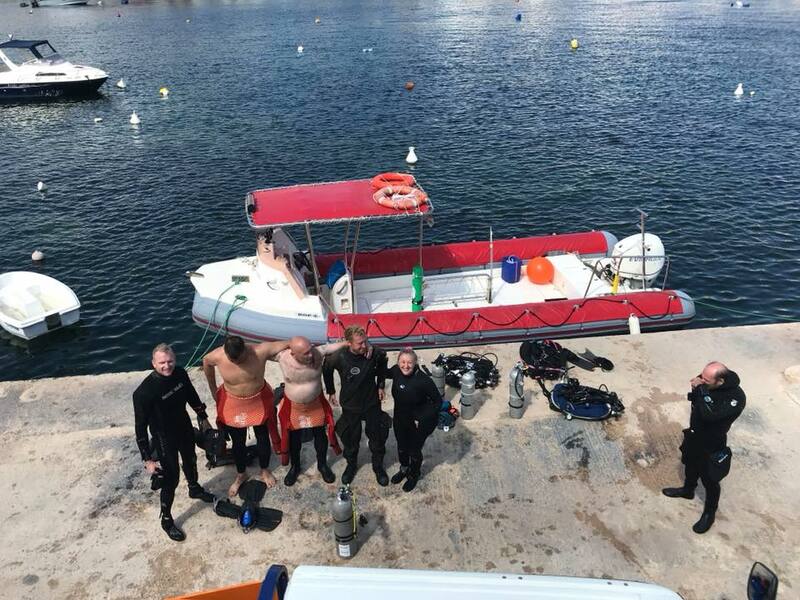 Alternatively, divers were taken to new dive sites in Gozo. Since their gas mix was already made for the depth, they took that opportunity to get to this new dive site with depth. Unfortunately, none of them were photography divers, so no pictures available. We shall have someone with video or camera for next time. Tech Diving is maybe not for everyone. It applies good planning, good gas calculation, good buoyancy control, good mental strength, etc. If there is something you want to see at the depth, it worth going through those challenges. Most pleasure diving is within Recreational Diving limits. Tech Diving is an additional option for your diving adventure. 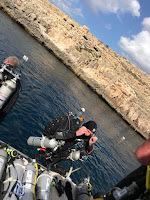 If you are interested, you are always welcome to take "Try Tech Diving" and see if you like it or not. If you enjoy it, it will be another option for you. If not, don't worry. There are plenty of divings that you can do within Recreational Diving limits. After all, Diving is FUN!! 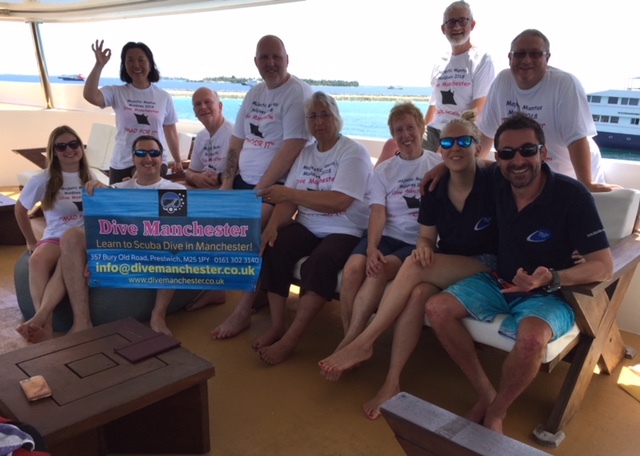 DM Club Maldives Trip 2018 - Sharks, Manta Rays, Whale Sharks!!! Fantastic!! DM Club 2018 Maldives Trip was in June. Maldives is known with beautiful water, wonderful marine life, Big Fish, Small Fish, everything! Our original itinerary was "Majestic Manta"; however, it had to be changed due to the tide. Well, still, Maldives is Maldives. This beautiful water had so much to offer for all divers. From the start, we saw sharks, sharks, and sharks!! They are so graceful. Beautiful creatures. Are you afraid of Sharks? Don't worry! Stay behind me! They are afraid of Japanese!! 😂😂 In fact, most sharks are not what you think like "Jaws". They don't like divers' bubbles. It is too noisy for them and they always swim away from divers. We saw so many fish!! Turtles, nudibranchs, and more!! Huge surprise in this trip was Whale Sharks. The guides had not seen Whale Sharks for about a month, so they told us the chance was very thin but not zero. Well, when the expectation was set so low, the surprise was even bigger! On the morning dive, one big Whale Shark just appeared from the bottom of the sea, swimming through us and upward. I was not ready!! I quickly turned my camera on and started shooting a video. Such a fantastic moment! I was soooo close to her! When I check the video, OMG!! It was not on!! How could I mess up with camera?? I'm "Japanese"!! We are born with Cameras!! 😳 Such a disgraceful Japanese I am...😭 On the second dive of the day, well, God heard my cry!! Three Whale Sharks appeared right by us! Fantastic!! My camera works were still rubbish because of too much excitement, but no bother. We swam with Whale Sharks! For camera lovers, I strongly recommend a dive site called, "Fish Tank", near by Male. It was really like swimming in the fish tank! Because the fish factory above is throwing away their fish waste, they don't fight for food at all. Amazing thing was you could find 3-4 huge moray eels sharing one hole, sticking their heads out without fighting. You never see such thing. And all of them were sooooo fat and huge. Oh, Stingrays were funny. They were teasers. They swim right under divers, like arm length close. I could nearly touch them. We spent about 70 minutes while we were supposed to be out from water in 60 minutes. Oops! On the last day of our whole trip, miracle happened. Three Manta Rays appeared!! We were over the moon! We nearly gave up on finding Manta Rays. God really heard our cry. Three Manta Rays swimming through us over and over and over. So gracefully. What else can you ask for the last dive of your diving holiday? That was my 2461st dive. I still get all the excitement from diving. Yes, diving is FUN!! Beautiful Spring! Let's go Diving!! 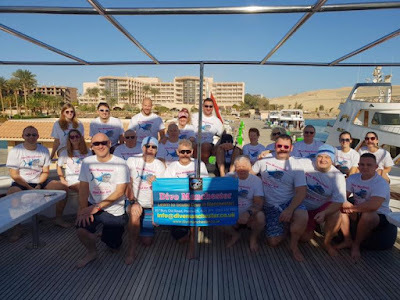 DM Club Trip 2019 starts with Red Sea Liveaboard! !